Taste test: These are crunchy rippled chips, though not as crunchy as the Herr's Smokey BBQ that we tasted the other day. 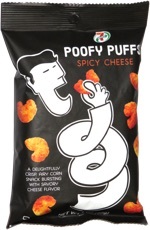 The barbecue powder is more spicy than sweet, and there's enough powder on the chips to leave residue on your fingers. 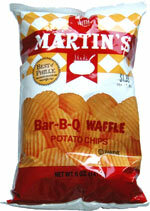 If you like barbecue chips that are spicier and saltier, then you can't go wrong with these. Smell test: A slight potato and barbecue smell.